What happens when the big one comes? 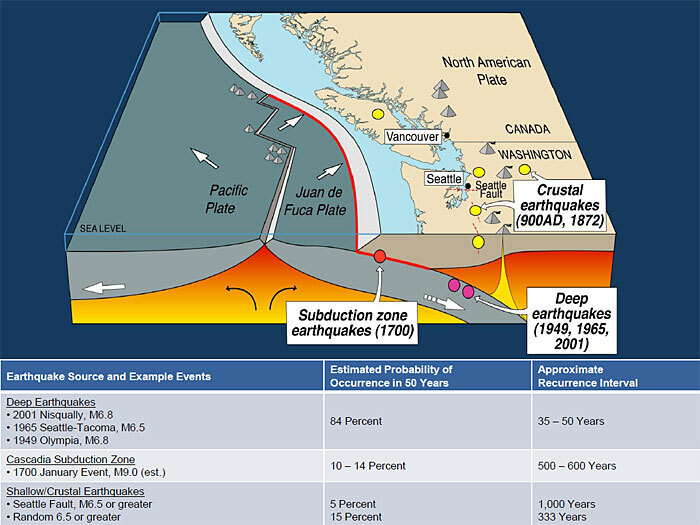 A major earthquake in the Pacific Northwest is a certainty, because of the structure of the Cascadia subduction zone. But what could happen, and how do Washington and neighboring states and provinces prepare for it? 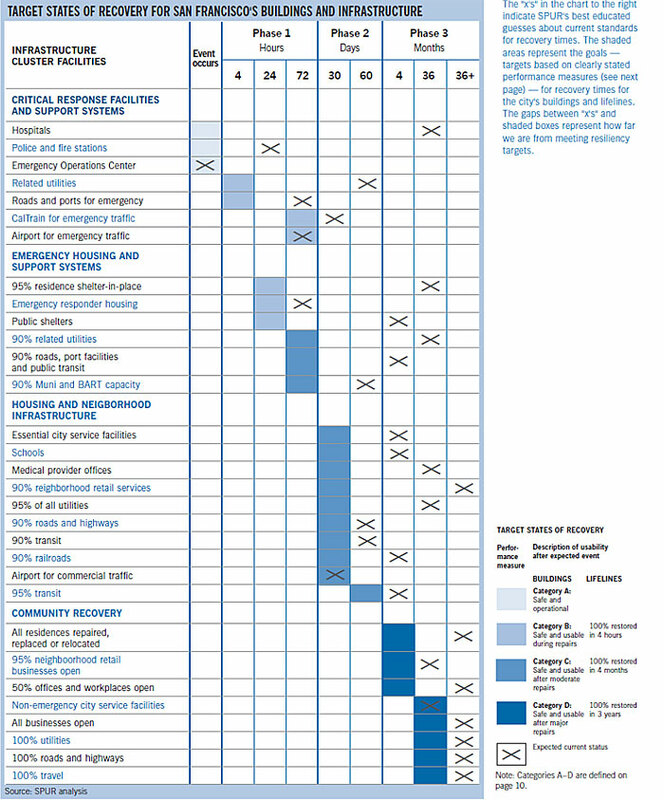 The Resilient Washington Initiative, a group put together by Washington Emergency Management Division, asked those questions in 2010. The group is planning for state-level resilience with respect to earthquake hazards. Here are some highlights from their initial report and their final assessment from February 2012. According to Tim Walsh from the Washington Department of Natural Resources, “An earthquake on the Seattle fault could generate ground shaking levels comparable to or greater than the recent earthquakes in Haiti and New Zealand. And while the largest shaking intensities would be limited to western Washington, the economic disruption caused by damage to port facilities could affect not just all of Washington but Alaska as well. 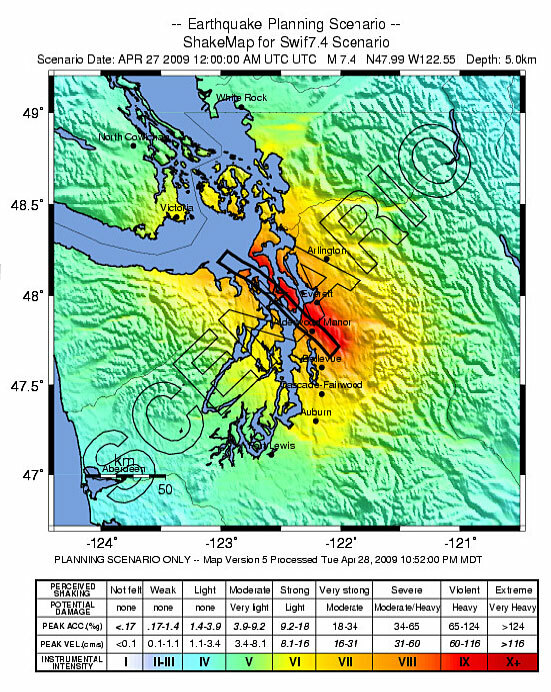 “Recent work on the southern Whidbey Island fault has demonstrated that it is capable of large (~M7.4) earthquakes... Damage from this scenario would not only be severe in northern Puget Sound but on Vancouver Island as well. 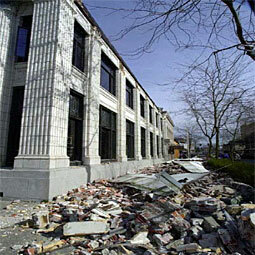 Many buildings are not prepared for a major quake. The Resilient Washington group says we must dovetail mitigation with response and recovery. To start, a pilot school project is underway. 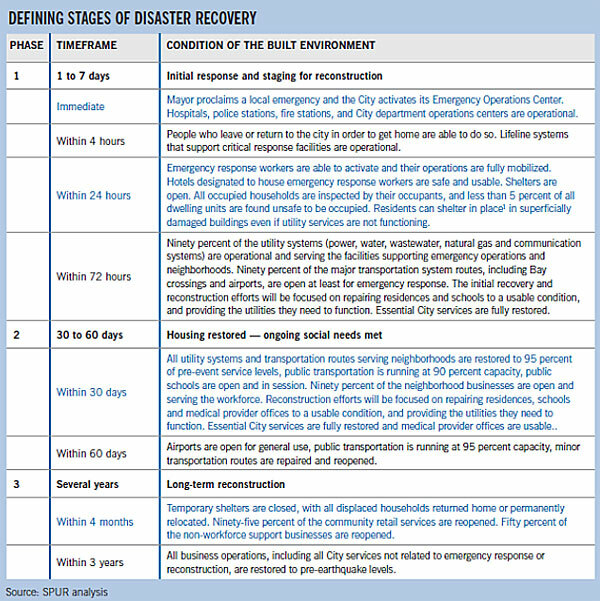 The chart below shows best guesses about recovery times for various buildings, based on analysis in San Francisco. 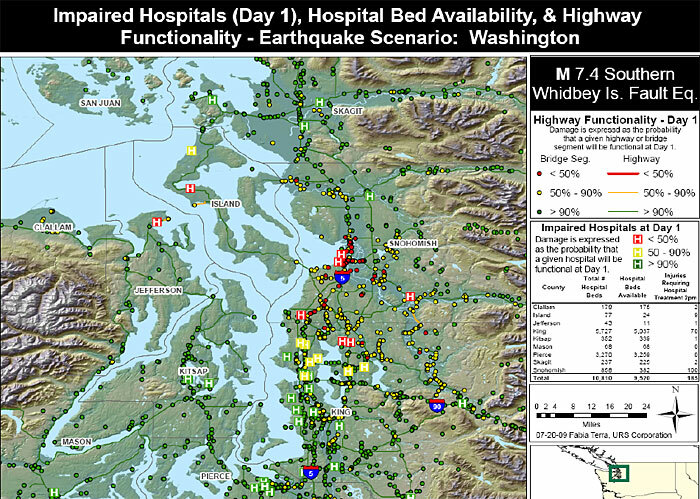 The map below shows which hospitals and highways would be impaired by a major earthquake in the Puget Sound area, and to what extent. By engineering standards how many deaths, how many building demolitions (or infrastructure failures), and how long a recovery time for various levels of earthquake. It’s also about the ability to recover, with life resuming in a short time frame, people staying in homes, and a return to new “normal” in few years. The goal for Washington is to make the state resilient within 50 years. 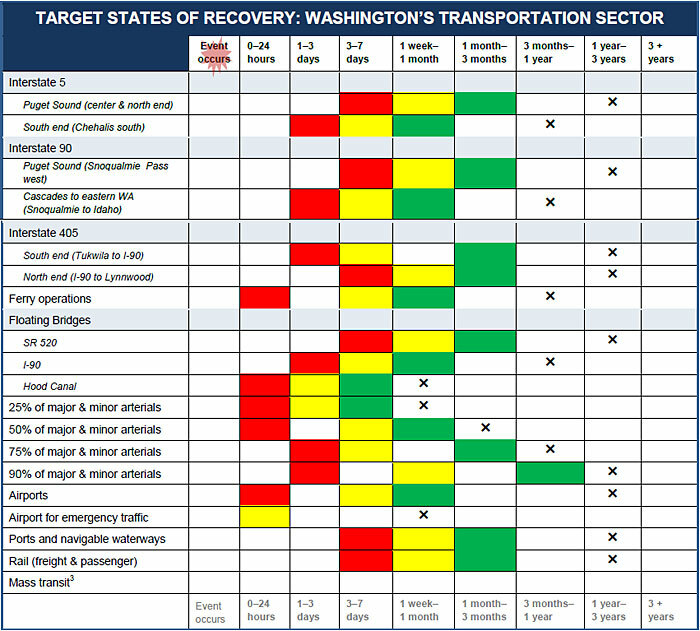 Below are charts showing targeted recovery times for critical services and transportation. The report goes into greater detail about the planning and potential damage. You can read the Resilient Washington report on the EMD website (PDF). Take action before an earthquake to minimize the impact. Unsecured bookcases, tall furniture, mirrors, wall hangings, and other items could fall over or break during an earthquake and cause injury. Secure the contents of your home to protect yourself and your loved ones. The best method to protect yourself during an earthquake is to Drop, Cover, and Hold. Be sure to practice taking cover in a safe place in each room. This will help you quickly move to your safe place during an earthquake instead of responding to the instinctive urge to run. Be ready to respond after an earthquake by dressing for safety. Protect your head, feet and hands. Have a pair of sturdy shoes, leather gloves and a hard hat under your bed so you know where to get the essentials, day or night. Information courtesy Washington Emergency Management Division.